Over the last twelve months, associations, unions, and statewide organizations of Oregon faculty, academic professionals, and graduate student employees, hailing from every corner of our fine state, have reached out to one another and supported one another in numerous ways—small and big—hundreds of times. In my 20 years as a university professor in Oregon, I had never seen an outpouring of solidarity among our faculty like the one we’ve witnessed in the last year. I cannot here offer a full chronicle, but will celebrate some highlights. Portland State University faculty and academic professionals felt the strong support of this emerging “one Oregon faculty” when they voted to go on strike a year ago. When faculty at the University of Oregon faced the prospect of shared governance rights in their university by-laws being scrapped, faculty from across the state (and our national organizations) responded swiftly. Colleagues from every part of the state sent support to, and even walked the picket lines with striking graduate teaching fellows at the U of O last December. One Oregon Faculty, one academic labor movement, one movement of university educators–without borders. This is our vision. April 26, 2014: AAUP-Oregon Annual Meeting, OSU, Corvallis. 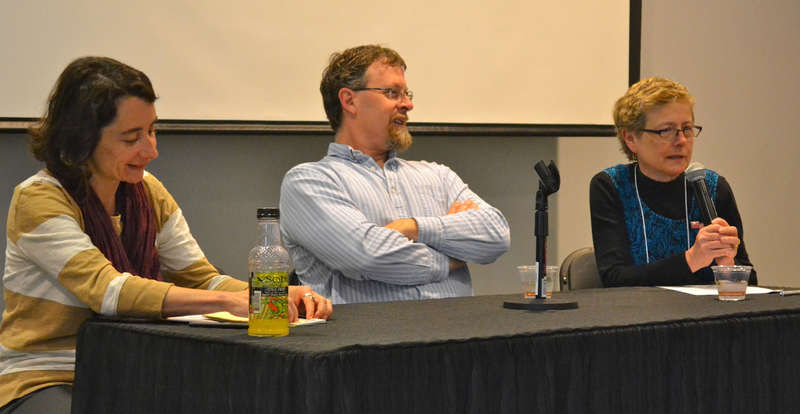 September 24, 2014: AAUP-Oregon Collective Bargaining Summit, UO, Eugene. 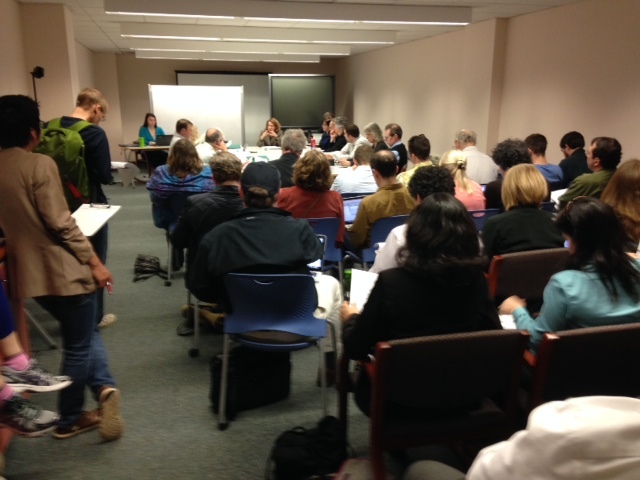 October 25, 2014: AAUP-Oregon Legislative Summit, OSU, Corvallis. April 25, 2015: AAUP-Oregon Annual Meeting, UO, Eugene. Over the course of these gatherings, we witnessed the coming together of AAUP collective bargaining chapters (PSU-AAUP); joint AFT-AAUP collective bargaining chapters (UA-University of Oregon); AFT chapters (PSU Faculty Association, Western Oregon University, Eastern Oregon University, Graduate Teaching Fellows Federation-UO, Coalition of Graduate Employees-OSU); independent collective bargaining chapters (Association of Professors, SOU); advocacy chapters, individual members not yet organized into a union and other faculty advocates (Oregon State University-AAUP, Linfield College, Willamette University, Association of Oregon Faculties). Friends and allies from the Oregon Students Association, Oregon Education Association, SEIU, AFT-Oregon, among others, have also graced us with their presence, warmth, and solidarity. A unspeakable thrill it is to experience ourselves part of a movement — pluralistic, with all shapes, flavors, and stripes represented, and ever more unified! A year ago, our historical lines of division — campus, union, parent organization, rank, student status, etc. – were all about us. By April 25 of this year, when we gathered in Eugene, OR, for the AAUP Annual Meeting, the old boundaries all but dissolved into an overwhelming shared feeling that we are one. Just, debt-free, access to higher education for our citizens. Higher education is a human right. Just priority placed on education in our university budgets, and lines of accountability (with a strong voice for students, faculty, and academic professionals) to realign our budgets with a just sense of priorities. Cultivating a relationship with our new Boards of Trustees guided by a deep respect for the values of shared governance and academic freedom. As One Oregon Faculty, one academic labor movement, one movement of university educators — without borders — we forge ahead! On Saturday April 25, activist faculty from around the state gathered in Eugene to build solidarity and create a plan for moving toward debt-free, student-centered, educator-led higher education. AAUP-Oregon President José Padin gave participants an overview of our activity at AAUP-Oregon since the last conference, followed by presentations on the work of our chapters over the past year. Much has been done to build the CB chapters at University of Oregon and Portland State and the advocacy chapter at Oregon State. 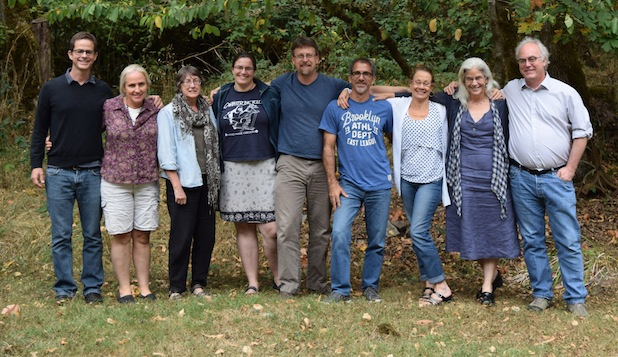 AAUP-Oregon provides a vehicle for linking these efforts through support for organizing, through connecting leaders who are engaged in collective bargaining, and through legislative work. 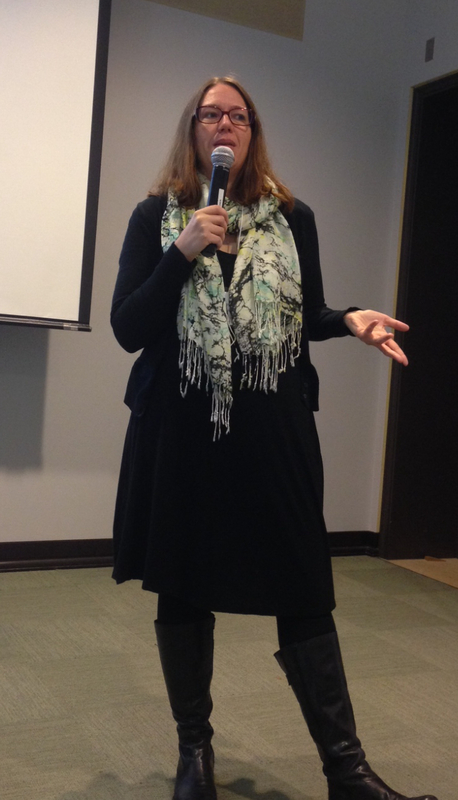 After a presentation on basic organizing strategies, led ably by Dawn Tefft, our new Pacific NW regional organizer, along with organizers from PSU-AAUP, United Academics at UO, and AAUP-Oregon, we broke into strategy sessions. One session discussed how to work with the new independent boards, one looked at how to organize around our collective bargaining campaigns, and the third focused on advocacy or issue organizing. As the strategy sessions reported to the final plenary, it became clear that we were all moving in the same direction; both the CB and independent boards sessions recom mended taking on the issue of university budget transparency and recommended building power to change the priorities currently seen in university budgets, using all the tools at our disposal—campus organizing, coalition building, and legislative work. “We accomplished a lot and look forward to implementing our plan”, said President José Padin at the end of the day. At PSU, two faculty unions have teamed up to imagine higher education that’s student-centered, educator-led and debt-free. Both the AAUP chapter of full-time faculty and the AFT chapter of part-time faculty begin bargaining this spring. We held our first-ever joint action on May 6, celebrating the start of contract negotiations for over 2,000 academic workers. Our rally featured party hats; cupcakes marking AAUP national’s 100th birthday; and speeches from our allies at SEIU and the PSU student union. We linked issues such as job security and fair compensation to our broader vision for this university. 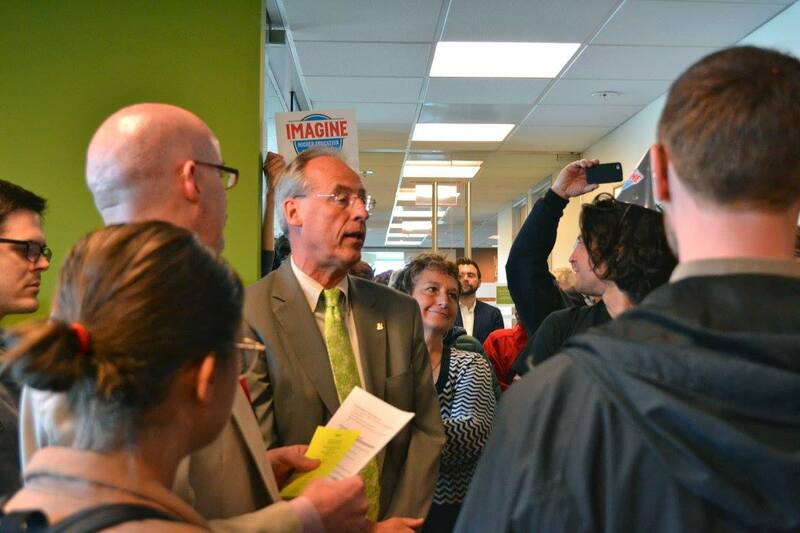 The crowd then marched to President Wim Wiewel’s office and packed the lobby. Professor José Padín presented Wiewel with a cupcake and a sign asking him to imagine higher education that’s student-centered, educator-led and debt-free. We made clear that during negotiations, Wiewel has the opportunity to take concrete steps toward our positive vision. 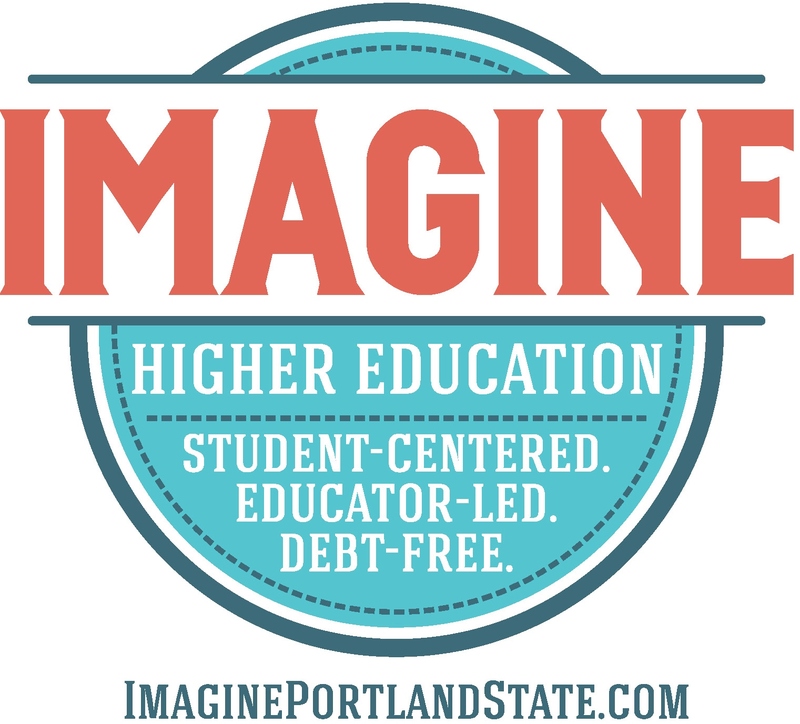 The “Imagine” campaign builds on strengths and lessons learned from our contract negotiations in 2013-2014. Still a recent memory at PSU, the previous bargaining cycle culminated in a 97% strike authorization vote and a massive walkout of students demonstrating their solidarity. PSU-AAUP understands the importance of working closely with our allies and articulating not just what we’re against, but also what we stand for. In the months ahead, we look forward to engaging the campus-community in imagining PSU’s future. Visit imagineportlandstate.com for more. Bargaining between United Academics and the UO Administration has been moving along rather smoothly, except for the economics proposal. At recent bargaining sessions there has been tentative agreement on the internal governance article that faculty have the right to propose modifications to the internal governance policies of a department/unit, including the merit and promotion and review policies. The administration also agreed to form a joint committee to explore the establishment of a sick leave bank. We were unsuccessful at achieving this in our first contract so we are encouraged that the administration is willing to talk about it this time around. We are still in disagreement over the reasons for terminating a non-tenure track faculty member. We proposed the following reasons: poor performance, financial exigency, programmatic changes or replacement of a NTTF with a tenure track faculty member. The administration maintains that it needs still more flexibility in these matters. On May 14, United Academics will respond to the administration’s economic counterproposal that put on the table no raises for faculty, no external or internal equity adjustments and merit pools of 1% total salaries each for tenure-track and non-tenure track faculty in the contract’s 2nd year. Twenty percent of each pool would be used by the deans at “their own discretion.” There would also be a one-time payment of $600 for full time faculty and pro-rated for less than full time. We do not expect them to keep to a hard line on this lame proposal, but it will be a very interesting process moving forward. We will have a general membership meeting on May 13 and we expect that the faculty will have a lot to say on this issue. United Academics was delighted to host a successful AAUP-Oregon annual meeting at our Schnitzer Museum of Art on April 25. It was well attended as is noted elsewhere in this newsletter. We are deeply appreciative that AAUP-Oregon Executive Council sent a letter to the UO protesting the dismissal of the library archivist for releasing archival data concerning past UO presidents. Share the post "AAUP-Oregon News May 2015"